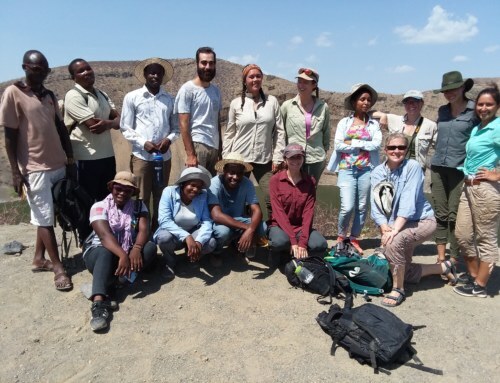 The ecology module has ended. 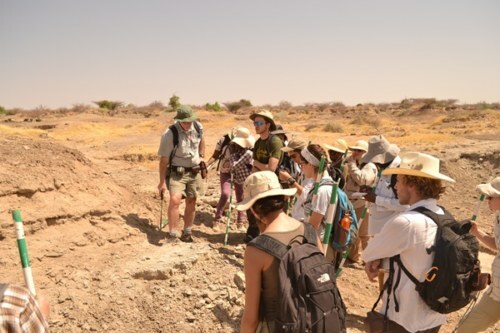 The next module, Geology, has started. 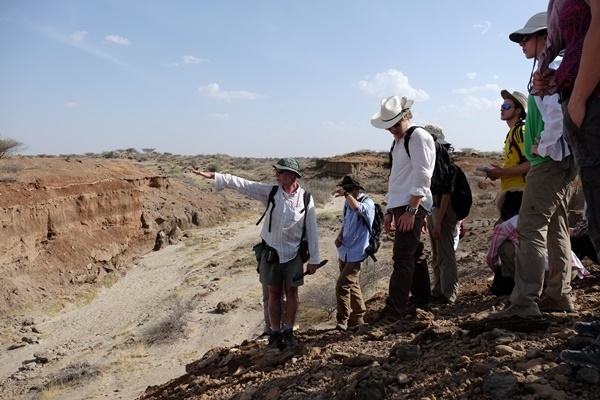 Dr Craig Feibel and Dr. Bob Raynolds are the instructors taking the students through the geological history of the Turkana Basin. 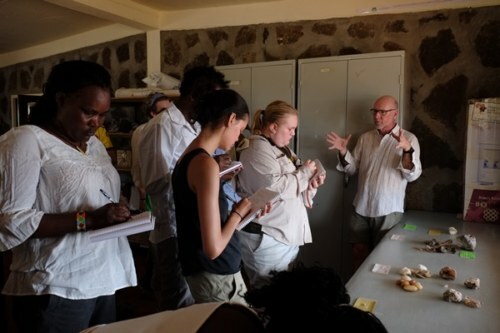 The students are spending time in the lab learning about rocks. 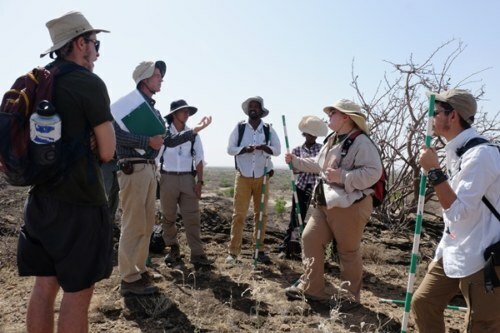 They are also going out into the field to test their knowledge on what they are taught during the class lectures. 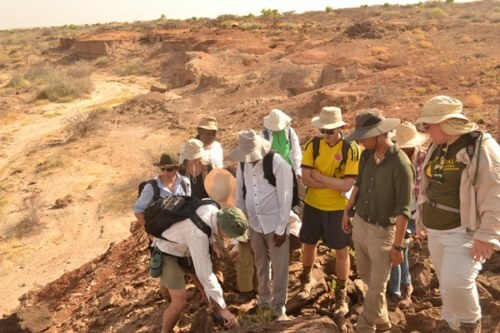 The students are learning about the sedimentary processes that have been shaping the landscape of the basin. 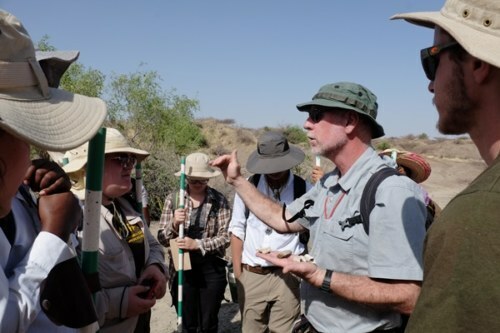 As Prof. Raynolds says, “The landscape has been formed by an interplay of two things, force of erosion and resistance to erosion.” The drainage systems within the basin have been responsible for erosion and deposition of sediments for millions of years. 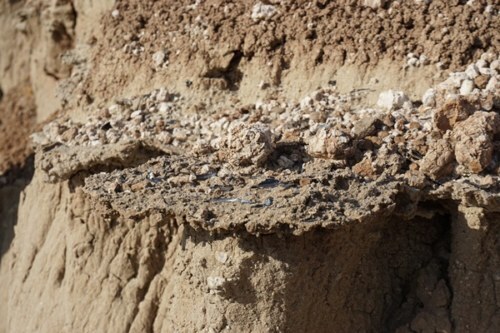 Sediments are carried by water or wind and deposited in strata. Force of energy of water sorts the smaller particles first followed by the bigger particles. Imagine if individual rice grains and balls of rice grains that have been moulded together were sprinkled on the ground. Water is then allowed to flow in order to move them. The individual grains would move further than the balls. As a result over time, the balls of rice would sit at the top of the individual grains. This is the same with clay and sand particles. Clay particles are smaller than sand particles. 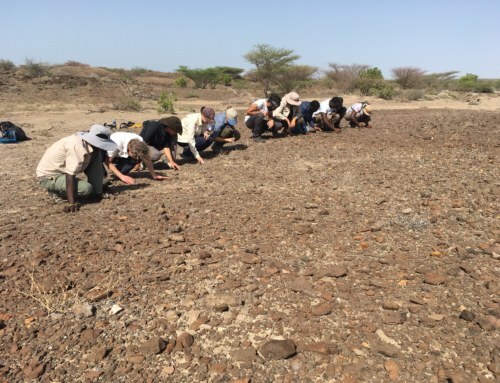 Mudstones which are made up of clay sit at the bottom of sandstones. 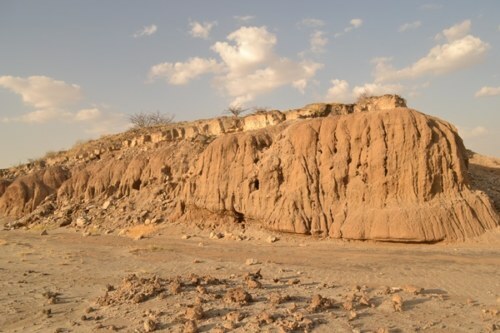 Paleo-river systems have been responsible for the formation of sandstones where most of the fossils recovered from the basin have been found. These sandstones can be found in river channels. They are cemented by Calcite (calcium carbonate) which is precipitated by organic action. 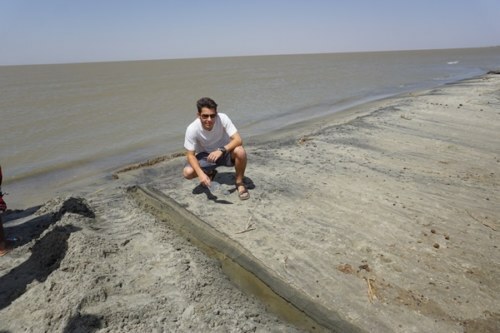 They are more resistant to erosion than the mud deposited on the flood plains. They are also the primary sources of fossils. Sandstones are sedimentary rocks. They are formed by deposited sand particles becoming cemented together by Calcite. Mudstones are another example of a sedimentary rock. The other two types of rocks include igneous and metamorphic rocks. Igneous rocks are formed from the cooling and solidification of molten lava from volcanic eruptions. 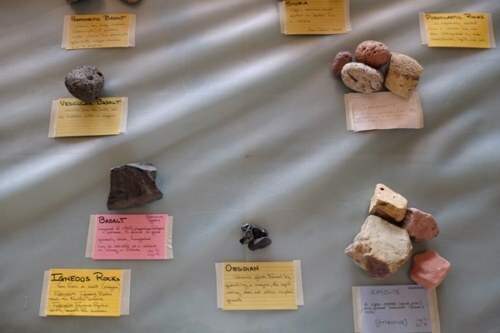 Examples include Basalt, Obsidian and Phonolite. 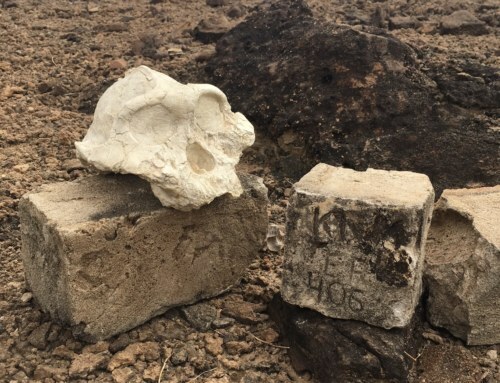 These three have been used as raw materials to make stone tools by our human ancestors. 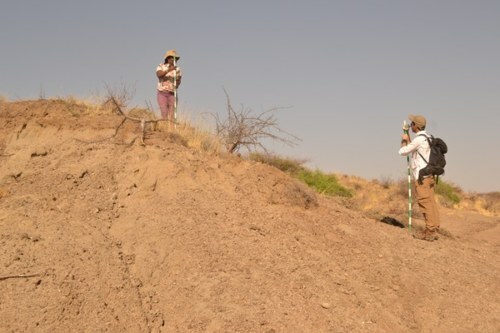 The Turkana basin has a good archaeological record of these tools. 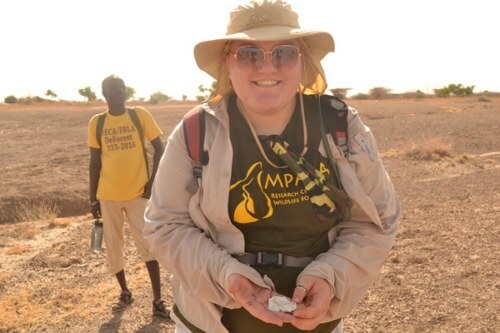 Metamorphic rocks result from changes in composition of pre-existing sedimentary or igneous rocks by high temperature or high pressure action. 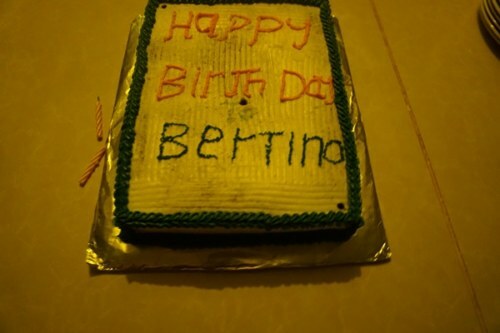 An example is Marble, which is formed from limestone that has undergone high pressure and high temperature. 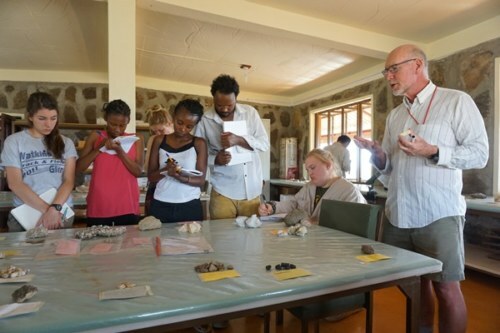 Prof. Feibel always emphasizes the importance of a geologic context when it comes to fossils. 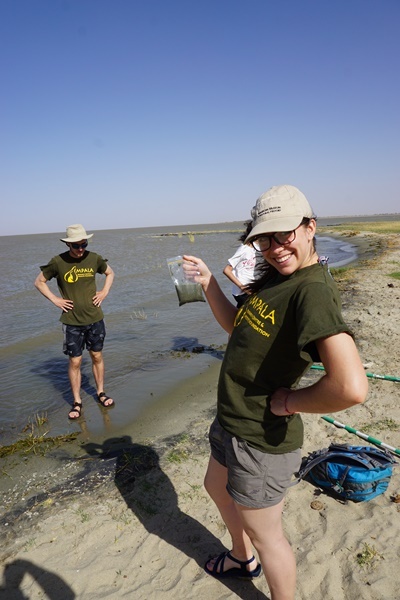 A fossil is as useful as it gets if the sediments where it has been found can be identified and recorded. 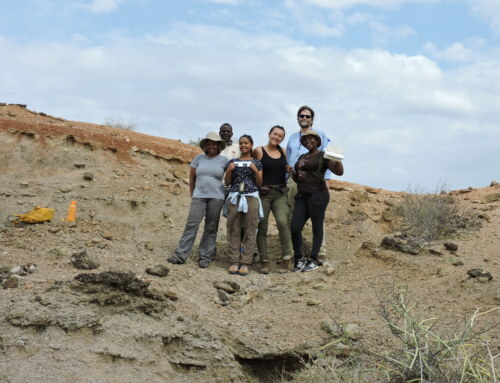 The sediments in the Turkana basin have been “sandwiched” within a series of volcanic tuffs. A tuff is a layer of volcanic ash made up of volcanic glass that is deposited after an eruption and eventually forms a sedimentary rock. This glass can be used in dating. If it has potassium-rich Feldspar crystals, the crystals can be used in dating using the Potassium-Argon method. 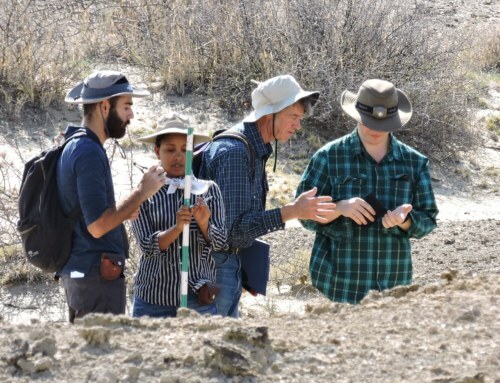 This is how researchers have been establishing the ages of fossils recovered from sediments within the basin. It is done by measuring the half life which the radioactive potassium-40 takes to decay to Argon-40. Half life is the amount of time it takes for half the amount of potassium-40 to decay to Argon-40. This method is comparable to radiocarbon dating where the half life it takes for radioactive carbon-14 to decay is known. The half life of carbon-14 is shorter at about 5760 years while that of potassium-40 is 1.3 billion years. Therefore, the Potassium-Argon method can be used to date materials over billions of years old. 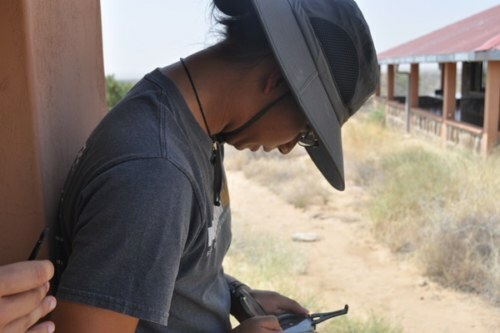 Two of the tools of trade of a Geologist are a compass and a GPS. Craig and Bob use them to navigate through the sediments. 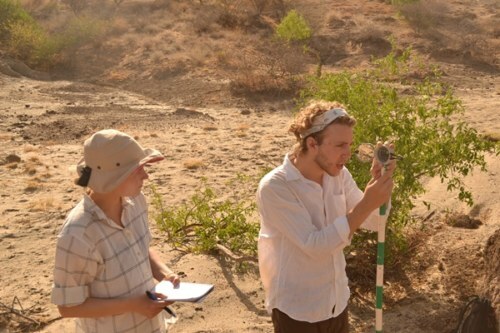 Geologists use compass bearings to determine, for example, the direction of flow of a river. This is useful when trying to reconstruct paleo-river systems. 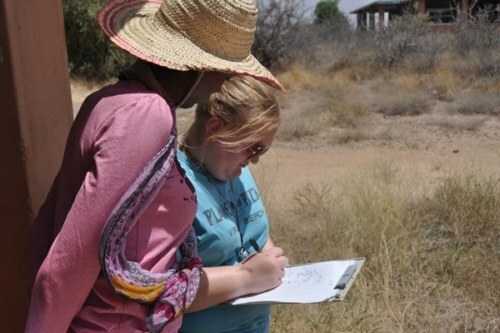 The students got to practice how to use a compass when creating maps as well as sketching sediment slope profiles. 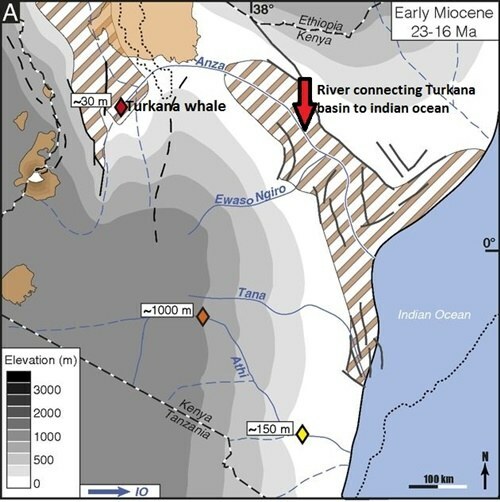 The Turkana basin has looked pretty much the same for the last four and a half million years. However, going deeper into time, it looked different from what it does now. It was connected to the Indian Ocean millions of years ago! 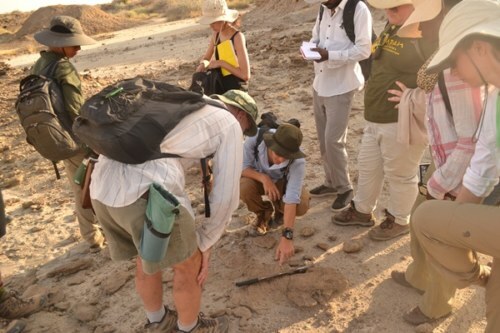 A beaked whale fossil was found within the basin and the sediments where it was recovered were dated back to 17 million years ago. This species of whales are only found in marine waters. What was it doing 740km from the coastline? 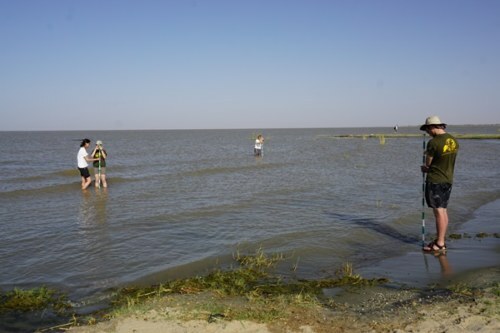 The explanation offered is that it must have swum up the river that connected the Ocean to the lake and got stranded. 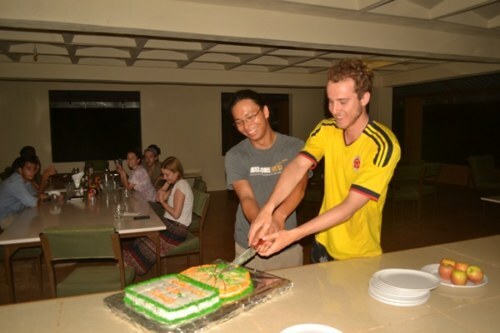 Three students have their birthdays during this Field school season. They are Tom, Nick and Rohan. 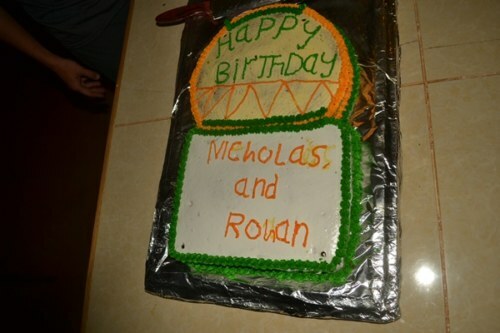 Nick and Rohan share the same birthday. 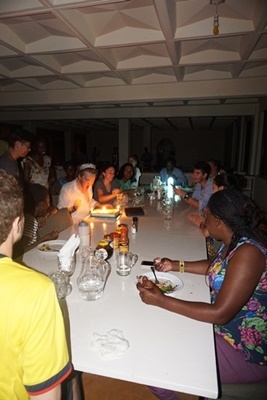 We celebrated all their birthdays here at TBI with delicious cake.